For most publishers, April 11th – 13th (and, for many, the preceeding weeks) meant only one thing: the 4oth annual London Book Fair. As a student, I was lucky enough to be able to attend all three days of one of the world’s largest publishing trade fairs for free. So on Monday morning, I found myself at Earls Court Exhibition Centre, joining 23,000 attendees exploring 1,600 exhibitors from 58 countries accross the world (thank you, The Independent, for the stats!). For the benefit of any unitiated readers, the main purpose of the fair, really, is for meetings. Publishers’ stands hum to the tune of negotiations (for example, for book rights) – and multiple-zeroed deals. * But for those of us not sitting at one of the intense-looking tables-for-two, there’s plenty more to do: chances to see what publishers are up to, opportunities to discover new, generally smaller, presses from accross the globe and – so I’m told – lots of networking and meeting of old friends (these may or may not have appeared to frequently have taken place at one of the numerous bars lining the exhibition centre). There are also lots of free (!) seminars on offer, covering pretty much every topic someone interested in the industry is ever likely to want to know about. The only problem was navigating the winding, expansive and frequently confusing exhibition centre to find them! (I now know what those tourists who stop in the middle of Oxford Street on a Saturday afternoon to consult their map feel like. I would say I’m now going to be more sympathetic towards them as a result, but, well… let’s not go too far). Even if a lot of ideas expressed in these regarding where the industry is heading are still very hypothetical, they were a fascinating insight into the current state of publishing. Of these, my personal highlight was, like many others I think, The Great Debate – not least for the heated, and frequently amusing, Twitter debate it provoked! This discussed whether publishers will soon be irrelevant, with arguments provided by Cory Doctorow, James Bridle, Andrew Franklin (Profile Books) and Richard Charkin (Bloomsbury). There is a fantastic write-up of this over at Publishing Talk which I could never improve upon, so I’ll just be lazy and let the link do the talking! Whose side was I on? While I don’t think – perhaps more would like not to think – that publishers will ever be unnecessary, I do agree with the general consensus to which all speakers eventually conceeded: the industry needs to change. It needs to modernise and adapt, and understand and embrace the new market far more effectively to survive in the current clime. This actually reminds me of the excellent talk I heard today from an innovative social media company. They have done some really exciting projects that seemed to capture the imagination of almost everyone in the room. But they suggested that publishers don’t want to do anything different. They just want to do what everyone else is doing. While I’d say it’s not true of all publishers (the exceptions are a whole ‘nother blog post … coming soon(ish)), I’d certainly have to agree that – for the majority – this appears to be the case. Soon just having Twitter, Facebook, blogs, author websites will (probably) not be enough. And all this social media will (again, probably) have to be looked at as something that can be used innovatively – not just as something we should probably be doing because everyone else is (just to generalise wildly, but I know it’s why I initially joined Twitter. And from what I’ve heard throughout my course, it’s an attitude that many seem to think that a lot of publishers – and, indeed, businesses in general, have adopted). Actually linked in quite nicely to that was a seminar that showed how Internet is changing how we (and especially young people) consume media. This was particularly timely after a recent survey stated that 80% of under 25s communicate using a ‘second screen’ while watching television. The Art of Immersion with Matt Locke (Channel 4) and Frank Rose (author of the titular book, published by WWNorton) was a really interesting insight into how media like television was developing new and innovative platforms to get people to get involved in programmes on a completely new level. Thing is, while this gave an idea as to where publishing could be heading, including what these new opportunities could mean for the industry and how we perceive the idea of a book could change, it was all exactly that: could. Not will. Examples of publishers actually embracing interactive media were noticeably few and far between. Sound familiar? I hate to be negative about an industry I love, but it looks like us bookish types are lagging behind a little (though again, there are honourable exceptions – to be saved for that blog entry I mentioned earlier). Although these were not the only seminars I attended, they were perhaps the ones that made me think most about the current state of publishing. It was odd, because it seems like most people know the industry has to embrace new technologies more actively and a lot of people – as demonstrated by Andrew Franklin and Richard Charkin when answering the question, ‘what do you need to do better’ – know kind of how they have to improve. But few seem quite able to make that bold leap into transmedia and really being bold, brave … innovative. I think the next few years could be really interesting for publishing – and I’m excited about the fact that the industry I enter (if I enter it soon, anyway. Here’s hoping!) could be completely unrecognisable in five years time. It’s just a case of embracing that – seemingly inevitable – change. And perhaps more importantly, how. Do you think social media will radicalise publishing as much as many are suggesting it should, could and would? Or do you think that it’s gone a bit too far, and digital and social media is just a fad? 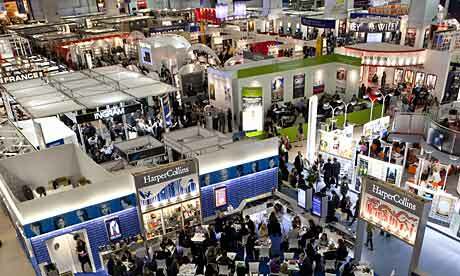 Comment below with your thoughts, and any other experiences of the London Book Fair 2011! *Apologies for the I-just-couldn’t-help-myself, but kind-of-failed attempt at a semi-pun. This entry was posted in Book Fairs, Publishing, Social Media and tagged Andrew Franklin, Bloomsbury, Cory Doctorow, cross-platforming, Frank Rose, James Bridle, LBF2011, London Book Fair, London Book Fair 2011, Matt Locke, Profile, Profile Books, Publishing, Richard Charkin, social media, social television, The Art of Immersion, WWNorton. Bookmark the permalink.